We’ve been experiencing some sky high temperatures in Brisbane this summer, with more to come. Now, Chinese medicine usually frowns upon a large intake of raw and cold temperature foods but on days like today fresh, raw food is incredibly cooling and refreshing. If you want to know more about how to live well in Summer (including some cooling tips) click here. 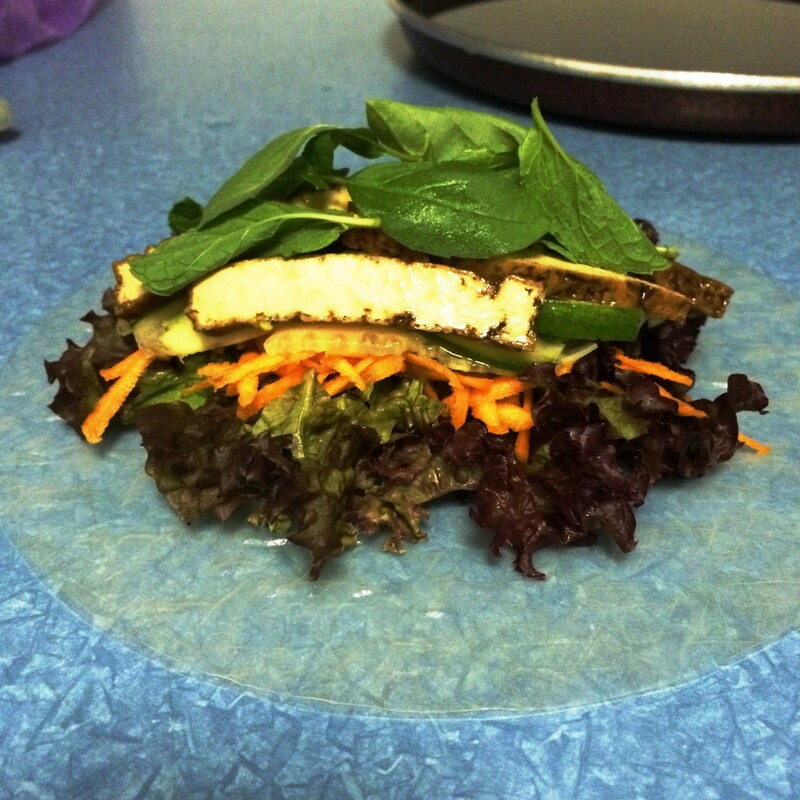 So, I’ve been making some vegetarian rice paper rolls. These can be easily adapted to include the vegies that you like best – you can use my recipe just as a suggestion. My rice paper rolls recipe is vegetarian but you can substitute the tofu for organic chicken or duck if that is your preference. Cucumber, lettuce and mint are considered to be thermally cold in Chinese medicine and that’s exactly why we’re using them on such a hot day. I like to team them up with some warming herbs including basil and coriander and a sauce that includes some fresh grated ginger and chilli to support the spleen and stomach (digestive system) with the extra burden of harder to digest raw food. So pay attention to your own body folks, and adjust the amount of raw food you eat that makes you feel well. Those with weak digestive systems or a tendency to ‘feel the cold’ would most likely do well to limit the raw food. Vary the ingredient quantities to make the amount of rolls that you require. It’s easy to prepare some more salad ingredients as you go if you run short. Tofu, pre-fried. Cut into thin slices. Add some warm water to a large bowl. 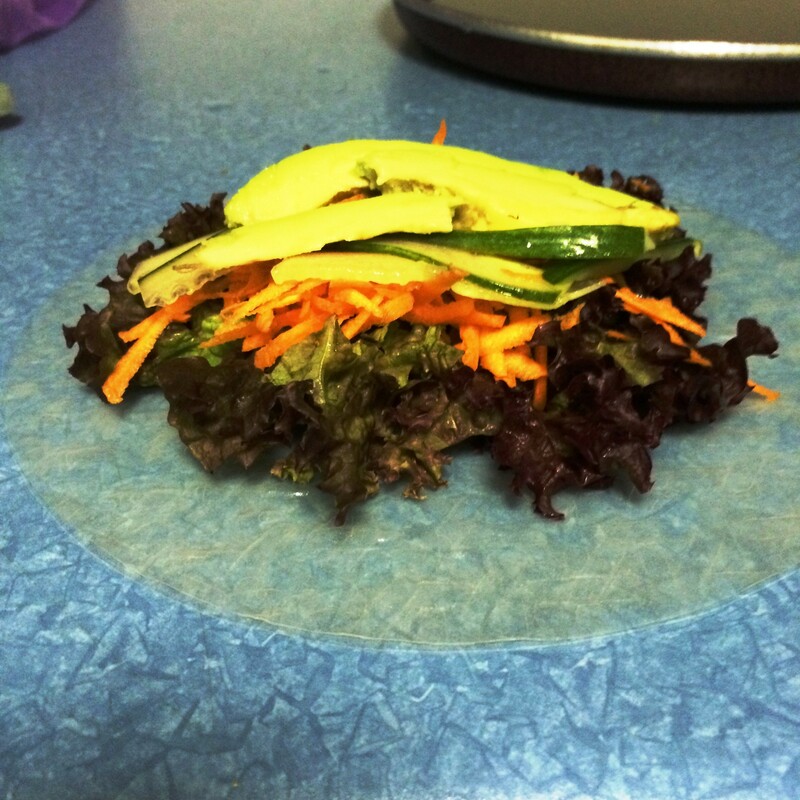 Soak a rice paper in the water for a few seconds and place on a clean, flat surface. Repeat with another rice paper and place it on top of the first rice paper. 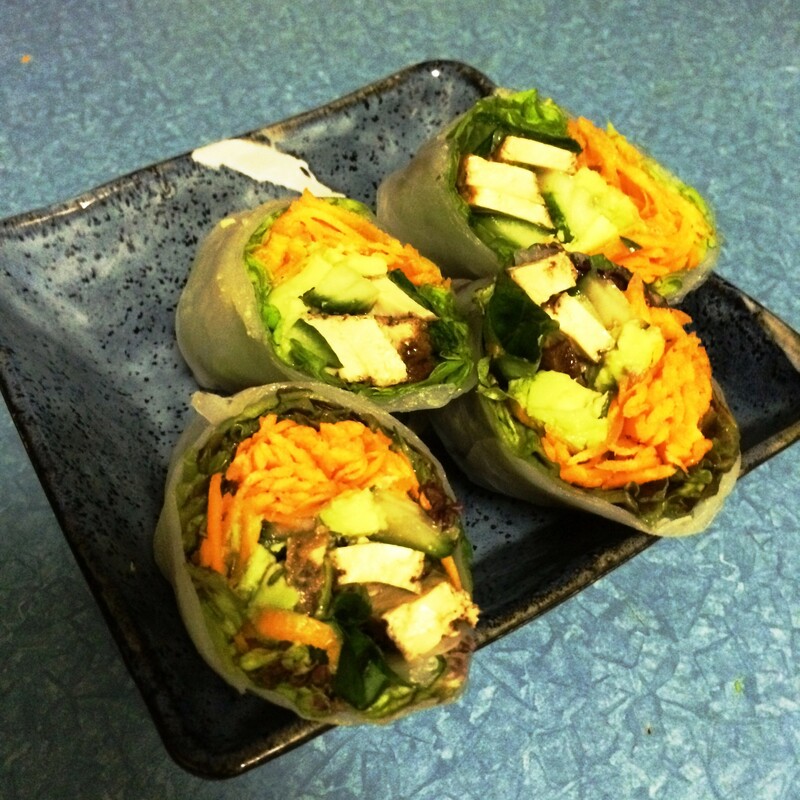 Lie a lettuce leaf in the half closest to you on the rice paper. Then top with some carrot, cucumber and capsicum. Add on top the avocado and tofu slices. Then place a few mint, basil and coriander leaves on top. Roll the rice paper end that is closest to you over the top squeezing the ingredients in tightly*. 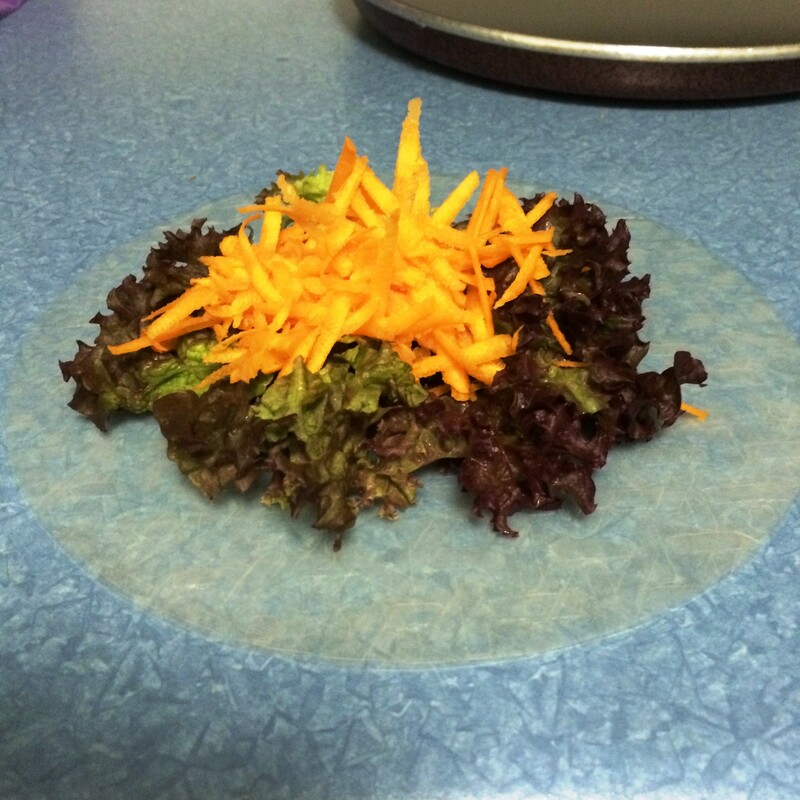 Roll away from you and tuck the sides in before you have finished rolling it up. 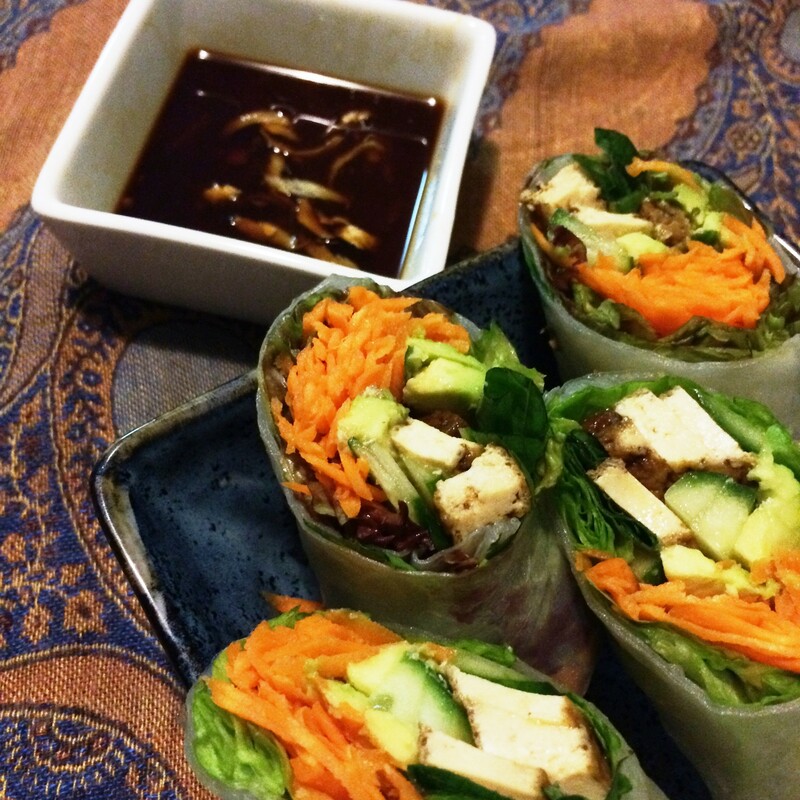 Repeat until you have made as many rice paper rolls as you desire. You can then serve them whole or slice them in half on an angle. *When you first start making these it will take a few attempts to get the filling quantity and rolling technique right, but once you have it these are easy to make. 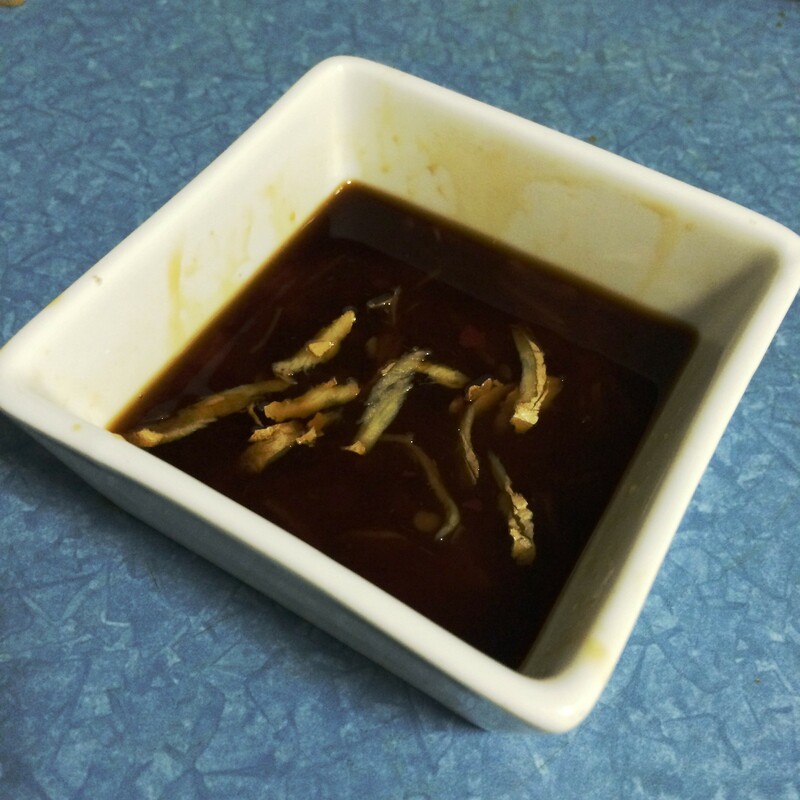 A quick dipping sauce can be made with a dash of tamari (gluten-free soy sauce), sweet chilli sauce, rice wine vinegar and freshly grated ginger. Set the quantities to suit your own taste. On my last curry night I made two desserts featuring spices sometimes used in curry: cardamom coconut cake and chilli-choc cookies. The cookies tasted like a delicious chocolate biscuit followed with a chilli burn. Not for the faint-hearted. Although, you can always just decrease the chilli if it’s not your thing. It is my thing – I love the chilli sizzle. And chocolate and chilli are a match made in heaven. I am also a big fan of chilli chocolate chai. Chilli has many uses in Chinese Medicine dietetics. Used fresh it can warm you up to the point of breaking a sweat, which then actually has a cooling effect on the body.This is an excellent treatment for the early stages of a common cold – we call it releasing the exterior. Think about the effect of a spicy vietnamese soup (pho). Dried chilli has a warmer action (and if you don’t use it in sweat producing quantities) it can be an excellent spice to use to warm you up on cold days. Think about soups, casseroles and curries. But for now, the cookie recipe. 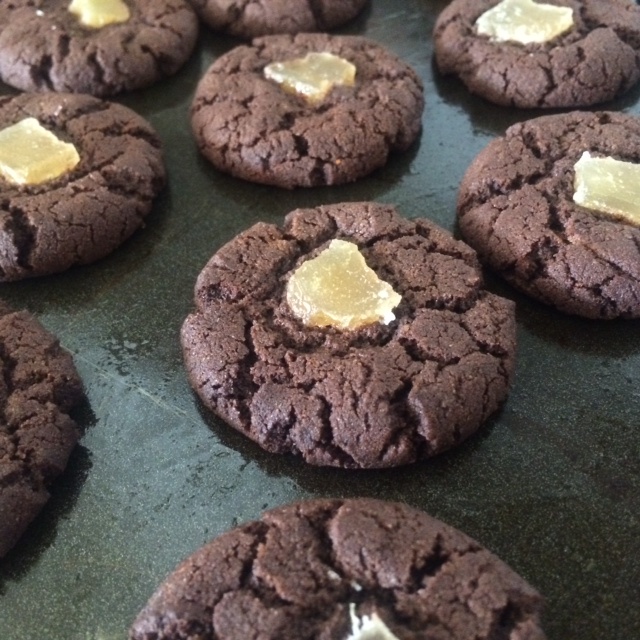 I converted this wonderful recipe I found over to be gluten and dairy-free, adapted the sweeteners and added a ginger centrepiece to each cookie. Sift flour, cocoa, bicarb and chilli powder. Mix well. Add butter in spoonfuls and rub through with fingers until mixture resembles fine breadcrumbs. Add sugar and stir through. Add maple syrup and combine. You may need your hands for this. Take teaspoons of the mixture and roll into small balls and place on greased baking trays. 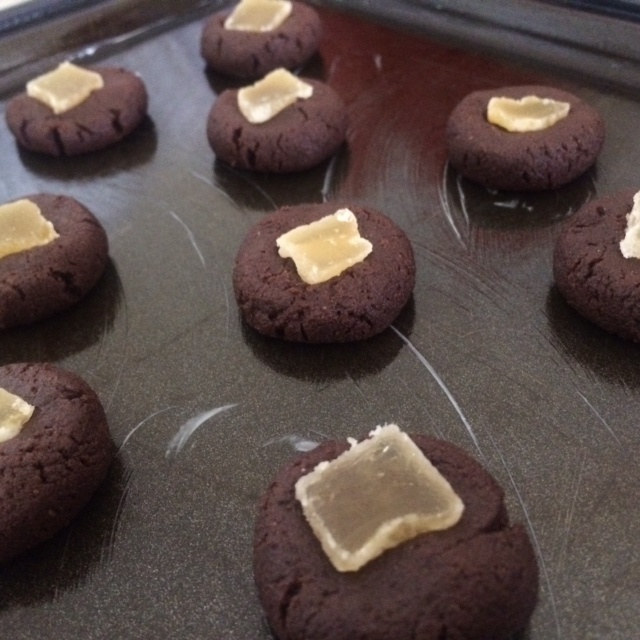 Leave adequate room for cookies to expand in the oven. Flatten slightly. Poke a slice of ginger into the top of each biscuit. Transfer to cooling rack after they have been out of the oven for 5 minutes. 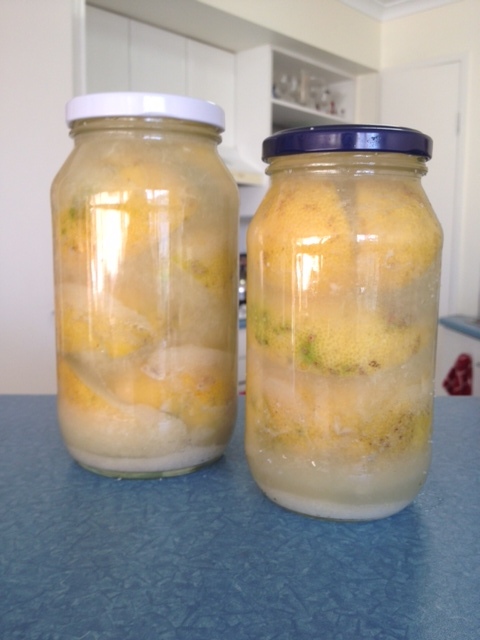 A couple of months ago I put on my very first batch of home made preserved lemons. I did a deal with my parents. 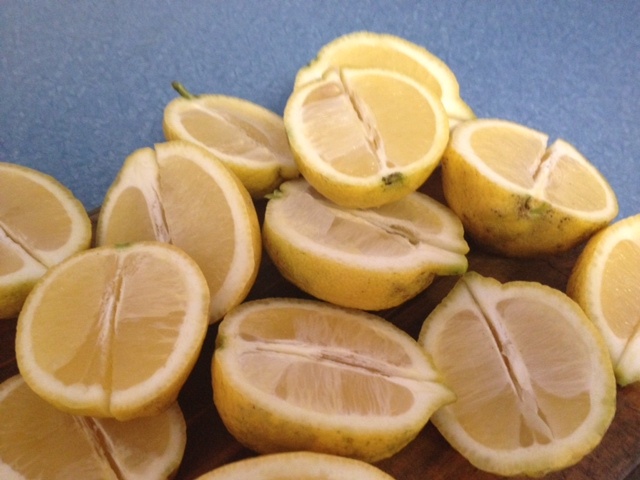 They supplied the homegrown organic lemons and two big jars, and I’d do the hard work of slicing, juicing, salting and storing – we’d end up with a big jar of the finished product each. Well, as it turns out they are as delicious as any I’ve ever bought and well worth the two month wait. I followed the Poh’s Kitchen recipe but I left my lemons in halves split down the middle (as if quartered) but still attached by the rind. I stuffed the salt into the split. Preserved lemons are often associated with Moroccan cooking, in particular tagines. But they also have been used in parts of Asia. When I was teaching Traditional Chinese Medicine (TCM) dietetics class last semester our very traditional Chinese text mentioned the preserved lemon. This salty and sour delicacy was said to be useful for “vomiting and loss of appetite or threatened abortion.” Which makes it a good food for relieving morning sickness. In fact, many women find that lemon or lime juice added to water does ease nausea associated with pregnancy. As for preventing miscarriage, well there are no clinical trials to back up this claim (and if you suspected that your pregnancy was at risk I’d be recommending a medical check up). But this traditional use relates to the the sour flavour which has an astringent, constricting quality and the salty flavour which benefits the Kidneys (the organ in TCM responsible for reproduction and birth, among many other functions). Another text recommends them for Phlegm-Heat disorders including bronchitis and sinusitis and Liver Qi stagnation (if you don’t know what that is click here). The other interesting thing about Chinese preserved lemons is that they are said to be a specialty of around the city of Nanning in Guangxi province, China. It was in this region that I completed my acupuncture internship at several teaching hospitals. The Zhuang people, an ethnic minority, used preserved lemons in their congee (Chinese rice porridge). Their preserved lemons are stored for far longer (eg. years) and look quite different. Here’s some more information and a recipe. Interestingly, during my studies in Nanning I also learned some traditional medicine techniques of the Zhuang people. I think they are simply delicious. If you want some recipes that feature preserved lemons as an ingredient, click here. Last weekend I made two after dinner sweets to follow a main course of several curries. I wanted the desserts to continue the fragrant spicy theme of the meal. 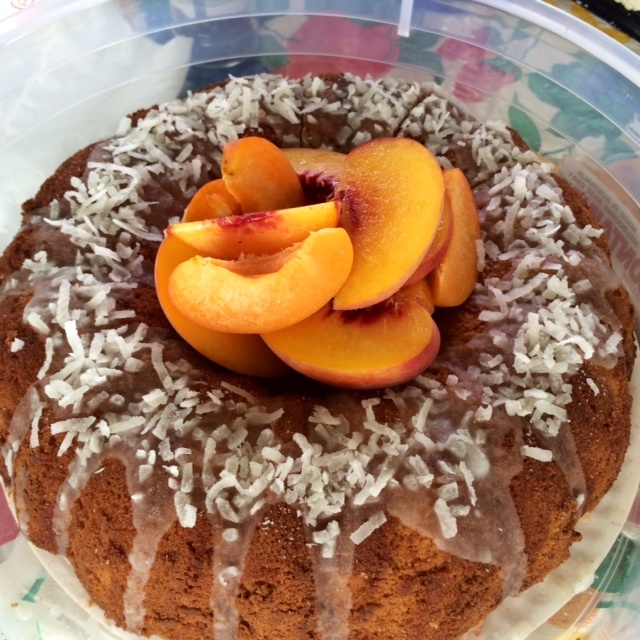 This cake was met with approval and so the recipe had to be shared. It has delicate spice and the perfect level of moisture due to the addition of coconut milk. The original recipe is here. I adapted it slightly to make it dairy-free, lower in sugar and to also make it with home made sweetened coconut as this ingredient is not easily found in Brisbane, Australia. I created my own cardamom glaze for decoration. In Traditional Chinese Medicine, cardamom is considered to be warming, pungent and slightly bitter. Cardamom is an excellent digestive stimulant. It is sometimes termed the “Queen of the Spices” and is probably best known for its use in curries but can also be added to cakes and biscuits. For more on cardamom and my two other favourite warming spices click here. Here’s a rosewater, cardamom and pistachio shortbread recipe and another for cardamom cookies. Did I mention that I LOVE cardamom? 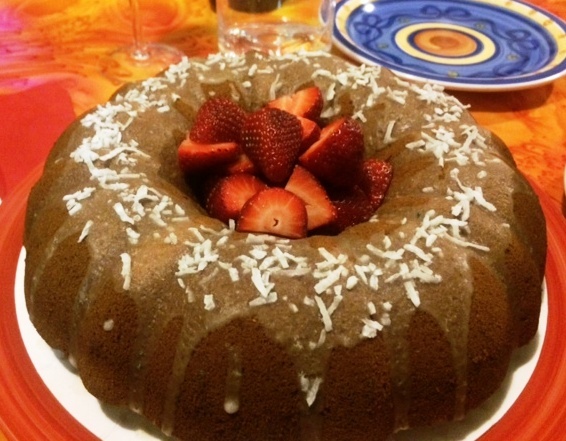 Grease a Bundt cake tin. In a small bowl mix flour, baking powder, salt and cardamom together. Set aside. Melt butter into coconut milk in a saucepan over low heat. Set aside. With a mixer, beat eggs and sugar until pale, thick and doubled in size. Add vanilla and rum. Add flour to the egg mix beating slowly until mixed through. Add shredded coconut and sweetened coconut and mix. Lastly, add coconut milk and mix through until mixture is smooth. Pour mixture into pan and bake for 1 hour or until cooked through (passing the skewer test). Leave in pan for 10 minutes before placing on a cooling rack. Glaze cake (to make glaze: sift icing sugar into a small bowl, add vanilla and cardamom, then add a little water at a time until glaze is the desired consistency to drizzle on the cake) and finish by sprinkling shredded coconut on top. Serve with strawberries or the fruit of your choice. To survive winter’s last hurrah in the form of this recent cold snap I made this delightfully fragrant and delicious soup. The root vegetables, beans and spices gently warm and nourish the body and digestive system (Spleen and Stomach) and boost energy according to the Traditional Chinese Medicine (TCM). Even the yellowy colour of the soup supports these organs and their corresponding Earth element. Heat oil in large saucepan. Fry onion, garlic, carrot, cumin seeds and mustard seeds until browned and crackling. Add turmeric and curry powders. Fry for a minute. Add potato, pumpkin, cauliflower, butter beans, vegetable stock, salt and pepper. Bring to the boil, then simmer for 20 minutes or until vegetables are soft. Allow soup to cool a little, add half of soup to food processor and blend. Return blended soup to the pot. Add green beans stir over heat and simmer for another 5 minutes. 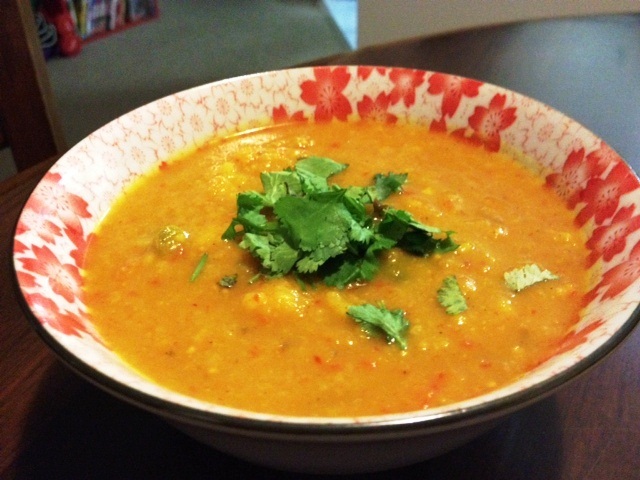 Serve in bowls topped with coriander. 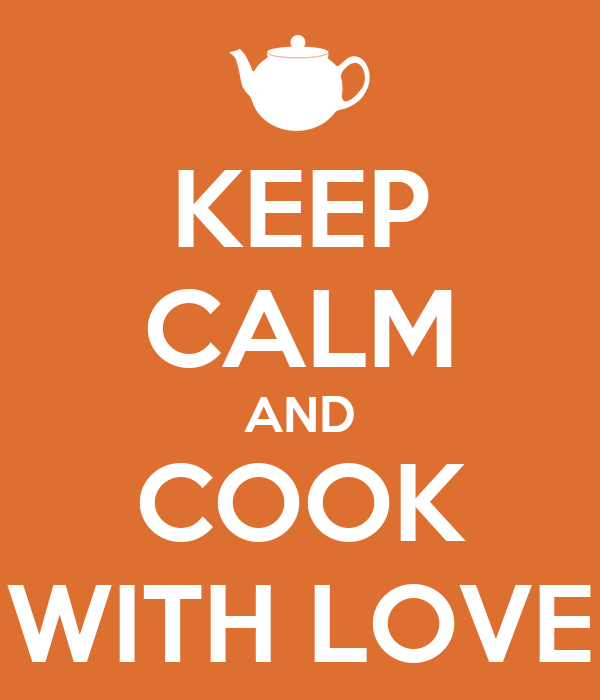 During a cooking disaster one must remember this! Last weekend I tried out a dish I have been curious about for ages. It was one of those chocolate avocado tarts that the vegans and raw food enthusiasts of the interweb claim to be as good as chocolate mousse. I’m neither vegan nor a raw foodie but am interested in dairy-free chocolate alternatives. A found a recipe for one in a book I had at home which claimed it “had gained a reputation” in the town in which the author lived. Sounded like a winner. This tart was to be consumed at a Saturday night gathering of some of my dearest acupuncture friends. And I have to say that the original chocolate avocado mix was a disaster! It tasted just as appetising as chocolate mixed with avocado sounds. So with much tinkering I resurrected it into the tart you find here. Still not confident that this was up-to-scratch to serve to my foodie health professional friends I considered swinging past the local shops for an emergency offering of a box of chocolates, just in case but ran out of time. I was lucky that being August in Queensland we have an abundance of fresh strawberries, some of which had been sold to me in a big punnet the day before at the clinic, fresh from the farm. These would have to do. The funny thing was that everyone at the gathering had experienced either cooking or take-away food disasters (which all turned out well in the end) for the food brought along that night. I wasn’t alone. 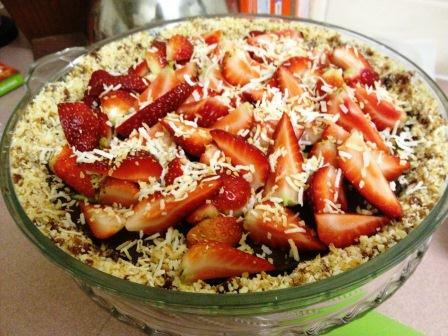 The tart once significantly tinkered with, refridgerated, then popped into the freezer briefly, decorated with strawberries and topped with toasted shredded coconut was actually quite popular. I was shocked and relieved. A comment was even made that if I hadn’t mentioned that avocado was an ingredient they would not have been able to tell. Being a Traditional Chinese Medicine practitioner, I couldn’t resist including (un)crystallised ginger to the base and ground cinnamon and ginger to the chocolate mix to enhance the digestibility, warmth and balance to what is essentially a very cold, rich, yin-style dessert. Large punnet of fresh strawberries, sliced. Gently toast almonds and coconut until golden in pan. Add to food processor and blend. Add dates and ginger pieces to almonds and coconut. Blend until mixture sticks together. Add some extra dates if mixture is not sticky enough. Add mixture to tart dish and spread evenly over base and sides, using your clean fist to press mixture down firmly. Put aside. Melt chocolate in a bowl over simmering water. Blend avocados in clean food processor until smooth. Add in melted chocolate, nut butter, maple syrup, ginger and cinnamon, blend until mixed well. Spoon chocolate avocado mix into tart base and smooth on top. Refridgerate until 30 minutes prior to serving. Gently toast shredded coconut until golden. Remove from pan and set aside for topping. Place tart in freezer for 30 minutes then top with sliced fresh strawberries and toasted shredded coconut. If you so desire, you may serve this tart with cream (or a dairy-free substitute) with a touch of cointreau. This weekend just gone I wanted to work through a few ingredients that were floating around in my pantry taking up space. 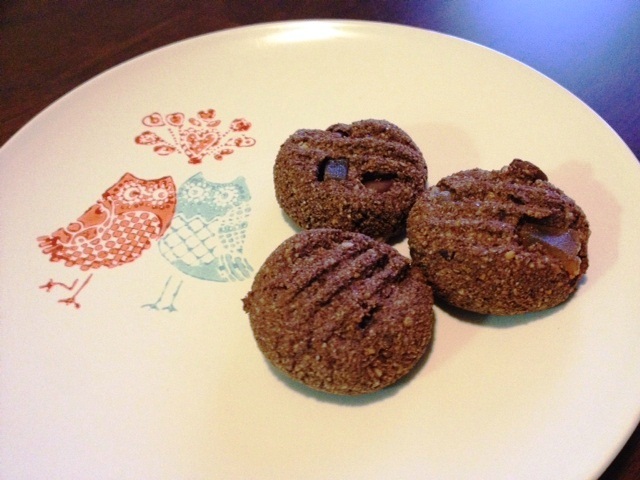 It gave me the perfect opportunity to test run these rich and chewy chocolate almond cookies with a few of my own modifications. All of the ingredients I already had at home and the whole recipe took about 20 minutes from prep to eating time. For the chocoholics among us, sometimes you need something on hand for a chocolate fix to prevent you from reaching that bit too often for those high sugar, low quality, impulse buy chocolates on offer. You need something with more protein, higher fibre and the option to control the sugar content that still hits the spot! These little biscuits do the job nicely in next to no time and with minimal washing up to do. Win-win! Ginger is an excellent digestive herb and enhances digestion of the rich nut and cocoa ingredients. I could eat ginger with just about anything – read more about my thoughts on ginger and its many uses here. Preheat oven to 180ºC. Line or grease two baking trays. Add egg whites and vanilla extract to dry ingredients, stir until mixture has an even consistency. Add choc chips and ginger, mix through. Roll dessertspoonfuls into balls and flatten with a fork on baking trays. Bake for 15 minutes. Allow to cool on baking tray.